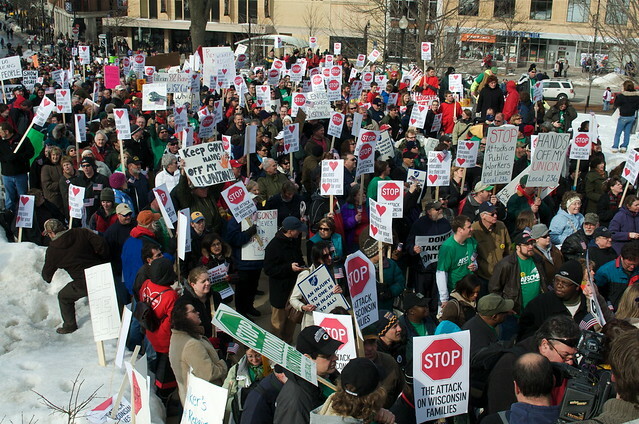 There were big doings in Madison, WI, today. 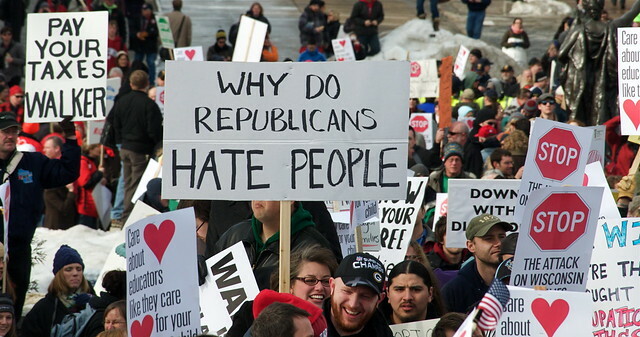 Our newly elected Governor, in office for approximately 45 days, has managed to so anger sane Democrats and even some Republicans, that in excess of 10,000 of them took to the Capitol and the sidewalks outside to rally in protest of his so-called "Budget Repair Bill". Heck, 700 students from my former high school (Madison East) walked the three miles to participate in active democracy. The rotunda of the Capitol was quite full, and when the slogan-chanting occurred it was impressively loud. Still, there were not more than a couple thousand people in there, and I was wondering if that was it. Then I went outside. It was really, really difficult to find a spot to capture the size of the crowd, and I do not have a wide-angle lens (gotta remedy that). I did make an effort at one point to count a section to try to extrapolate, but gave up. Suffice it to say that there were many thousand more out at the State Street entrance, filling that walk way, and also the sidewalks from Wisconsin Ave to W. Washington. In general, the crowd was polite, peaceful, and seriously pissed off with the Gov. 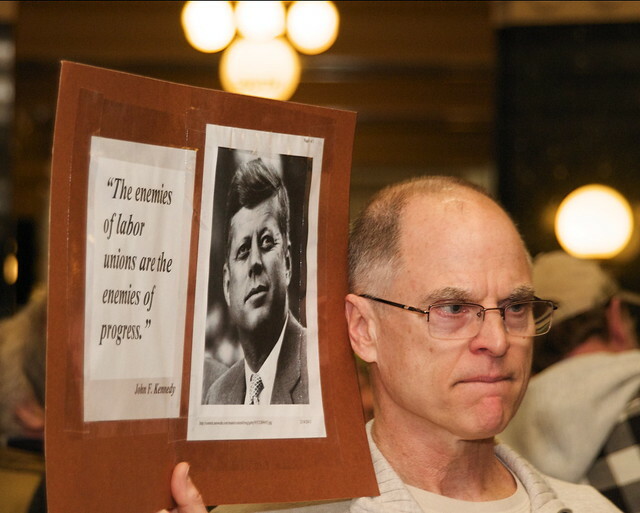 Among other boneheaded, wrong for Wisconsin things, the Governor's bill would strip collective bargaining rights from state employees and make it a fire-able offense for them to participate in a job-action or strike. 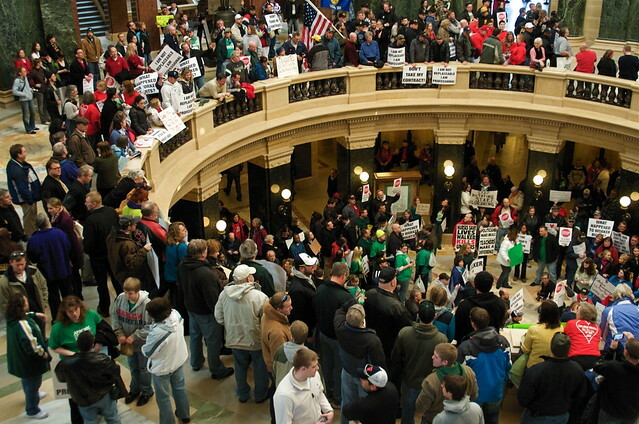 Basically, worker's rights would return to a status not seen in Wisconsin since the 1920's. Other proposed cuts would deeply affect BadgerCare, the state's health care safety net for the poorest citizens; attack funding for Planned Parenthood; cut funding to public schools; cut funding to the University (especially targeting departments the political Right finds galling); and to generally eviscerate unions in general. The list goes on, and I think it needs to be repeated that this Republican Gov wants to reduce taxes on corporations and the wealthy at the same time. Typical of current Republicans, this places the entire burden on those least able to bear it. If his plan is to make Madison's unemployment rate (and foreclosure and bankruptcy) the highest in Wisconsin, he is going about it the right way. I took a lot of photos today. You can find twoscore of them in a SLIDE SHOW for your inquiring mind.